Okay, on a serious note now. . .when Joey and I started dating in July of 1999, I immediately knew he was the one I wanted to marry. And one year later, we were married(lucky me!) He has every quality I ever wanted in a future husband-sweet, loving, funny, cute, quite debonair, righteous, laid-back, trustworthy, responsible, great with kids, solid in the gospel, thoughtful, humble and selfless. Oh, and a hottie with a body(again see side picture-look at those muscles!) We have created a beautiful life together with our three gorgeous and amazing daughters. I feel so privileged that he chose me to spend the rest of his life and eternity with. He is the best husband and father. He is also my most bestest friend. He is always there for me, he puts up with my mood swings, he is a good listener, he helps around the house way more than a lot of guys out there, he gives good back rubs, he puts his family first-I could go on and on about what an amazing man he is. I just love you so much Joey! Thanks for everything but most of all thanks for loving me and our children in the gentle way that you do. I'm excited to see what the future holds for us, aren't you? Its been a great 8 years! I can only imagine what the next 8 will bring. Happy Anniversary! I heart you! Thank you so much for turning Joey into prince charming. I love that picture! :~| is for the pic. j/k I got a laugh out of it. :o) is is for the super sweet post about us. I'm so lucky to have such a wonderful woman "by my side." I love you! you guys are adorable! happy anniversary to you! Happy Anniversary Holly and Joey! You guys are so cute. 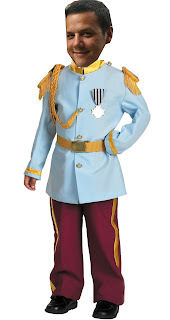 Love the picture of Joey as prince charming. You guys love each other too much and it makes me sick. Just kidding! You guys are so sweet to each other. I love that Ice Cream song. Now I want some. Happy Anniversary!!! Happy Anniversary!! Love the pic! Happy Anniversary you two! What a lovely couple you are and what a beautiful family! Todd and I are celebrating our 8th anniversary this year too! Congrats!!! You are such a cute couple. This is anniversary week for our family too. Erin and Patrick were married on the 8th and John and I were married on the 9th of July. We are leaving tomorrow to go to San Diego for 3 days to celebrate our 43rd. I'll be back late Wed. I'll be in touch then. ...have you decided if you can come over next week? Map quest says it takes 34 min. and is 26 miles. It takes longer in traffic but I would surely love to have you come. happy anniversh to you--you guys are babies, thought. you need to catch up with us old folks who did it up in 1991.....scary. Happy Anniversary a day late, but hey I told you 'Happy Anniversary' yesterday so I'm good. :) Love the picture, that was so funny. And you must really love him if you love him more than ice cream. lol I love you guys!!! I can't believe it has been 8 years. My how time flies. We love you guys. Happy Anniversary!!!! Happy Anniversary and cute post. Here's to many more years together. Just had to post again. I just finished watching the slideshow and just brought back so many good memories. Thanks again for posting the slideshow too cute to pass up. Happy Anniversary to Holly and Joey! Isn't it fun to think you have an eternity more of them?!? One day in Heaven we'll be chillin' and you'll say "it's our 4,876,098,643rd anniversary today." What gift is appropriate for that one anyways? Ah, you guys are such a beautiful family. Happy anniversary! I loved your sweet words -- and knowing both of you, I can say that you are just awesome!! Love you guys. 8 years, wow! I like your photoshop job of Joey, next year I will have to photoshop Lincoln. So, I saw Joey's blog for the first time today. I can't believe he blogs too! CONGRATS, CONGRATS, that picture is adorable! H- thanks for sharing your hubby and your kids with me on your anniversary... i realized on my way home in the last 10 months on your 2 days (b-day & anniversary) you were letting me have time with my brother when i needed him most. thank you so much. i love you and i hope that you have many many many more happy years together. Happy Anniversary! Eight years is a celebration indeed!! P.S. Joey makes a perfect prince charming!! P.S.S. 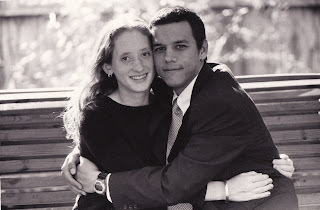 You guys sure look young in that engagement picture! 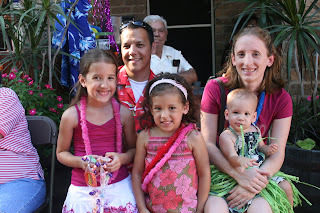 I love the picture of Cali eating the grass skirt, and so do my co-workers. She's such a cutie!